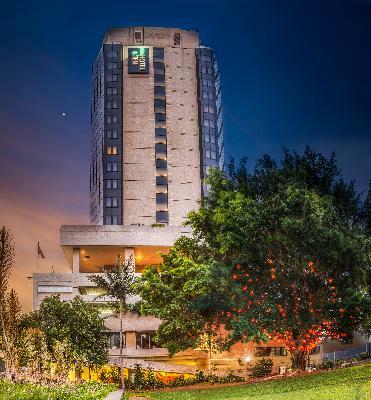 The Traders Hotel Brisbane (formerly the Holiday Inn Brisbane) is situated on the northern edge of the CBD, just a short stroll from the city centre and close to all transport facilities. This affordable Brisbane accommodation has a wide variety of spacious rooms and apartments, ranging from Superior Standard to King Studio and 3 bedroom fully self contained apartments, all of which feature amazing views of either the Roma Street Parkland or the Brisbane city skyline. Because of its easy access to all of the major businesses and tourist attractions the Traders Hotel Brisbane is the ideal place for your next holiday or business accommodation. It also features numerous guest services and facilites including lounge bar, conference centre, guest laundry, fitness equipment, lift, restaurant, room service, sauna, spa, tour desk, fee pay parking and 24 hour reception. The Traders Hotel is conveniently located next to the Brisbane Transit Centre, Roma St Parkland and only a short walk to the central business district, theatres and major shopping mall. The friendly staff at the Traders Hotel Brisbane provide the highest level of service to ensure that your stay with us is truly memorable. 3 Bedroom Apartment : Sleeps up to 6 guests on 1 King Bed, 1 Queen Bed & 2 Single Beds. King Deluxe Hotel Room : Sleeps up to 3 guests on 1 King Bed + 1 Rollaway Bed. Queen Hotel Room : Sleeps up to 2 guests on 1 Queen. Superior Hotel Room : Sleeps up to 5 guests on 1 Queen Bed Or 2 Double Beds + 1 Rollaway Bed.